As an art lover, artist and blogger I struggled with thinking about how to incorporate art into blogging. Realistically speaking, I do not have the time to go to exhibitions every week thus, reviews would be difficult to write if I can’t go to a museum. So I came up with this idea: Art Tuesdays. Art Tuesdays will be dedicated to submissions of my own personal work, whenever I do not have external content to review. 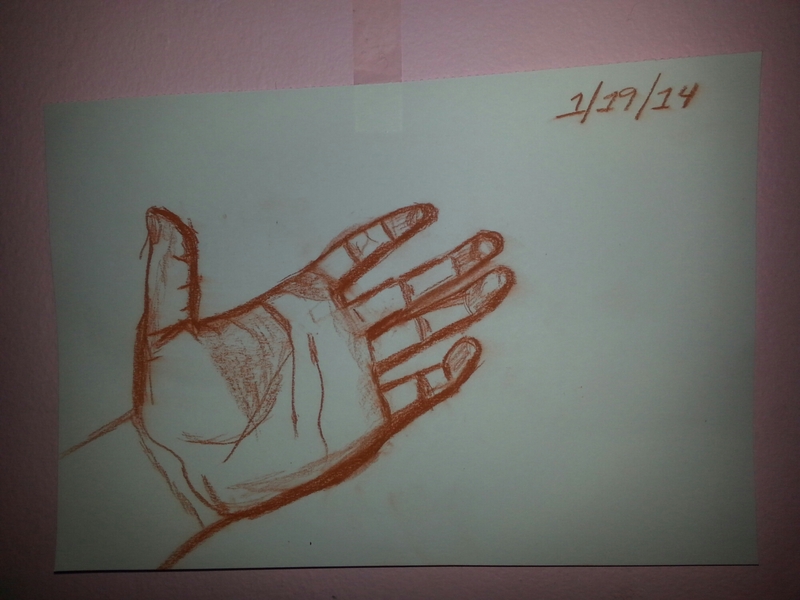 I drew A Hand to God on a day when I felt very lonely. If you look at the date on it, it is over a year old. But the message is still very clear in my mind. I have gone back and forth with my beliefs if a god exists or not. At one point, I considered myself an atheist. The one person I knew who dedicated their life to God (my grandfather) passed away from complications with a brain tumor and I could not understand how someone divine nor all loving could let this happen to someone so dedicated to him or her. Recently, I consider myself more agnostic. A brief definition of agnostic, for those who don’t know would be that I believe there could be a divine being but I personally am not putting a name on it. I only use ‘God’ in the title as a symbol. When I think about my life I consider myself very lucky. While I am not well off, I live comfortably. I eat everyday, sleep in my own bed. See my mom and step dad. Still talk to my dad occasionally although that’s awkward lol. But regardless of the trivial bad things that happen to me, I am lucky. I am lucky to be alive with so much potential and opportunity available to me. So, to get to the main point of why I drew this is: if there is someone, anyone pulling the strings, I reach my hand out to them and welcome them in. Instead of criticizing them for their flaws.